FeedBurner MyBrand service is another previously premium for-pay service other than FeedBurner Stats PRO that been makes free for all after Google acquisition of FeedBurner. The MyBrand PRO lets users maintain consistency between your feed address and your hosted website’s domain, especially for branding purpose. For example, typically the feed that goes through FeedBurner will have feeds.feedburner.com/MyFeedName as the default URL (link location). With MyBrand PRO, the URL will become feeds.mydomain.net/MyFeedName, where mydomain is your website domain name. It’s important that you control the rights and able to modify your own domain name DNS record in order to implement and enable MyBrand. Common sense is that if you pay for your own web hosting service or purchase a domain yourself (like from Surfnova), you should be able to use MyBrand. Else if you host your blog on free platform such as Blogger, WordPress.com and Blogsome (defunct), and own a sub-domain URL, you probably out of luck. Unless the publishing service permits domain aliasing, such as TypePad and LiveJournal. Turn On and Activate MyBrand. Click on the My Account link on top. 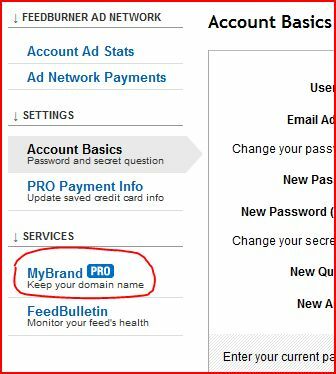 On My Account page, click on MyBrand PRO under Services section. Then a CNAME entry has to be created in the DNS records for each domain names that you want to use with MyBrand. To do so, login to your domain DNS zone or control panel. In WHM/cPanel, click on Edit DNS Zone link under DNS Functions. Depending on which DNS service providers you use, you may have different configuration method. Select the domain name DNS zone that you want to edit. Or in cPanel WebHost Manager, enter feeds in the first text field, pick CNAME as record type, and enter feeds.feedburner.com. in the last text field. Once done, input the new your branded feed URL (i.e feeds.mydomain.com) for MyBrand into FeedBurner (item 3 on the page). Click on Activate button to save and turn on MyBrand service.